Duluth’s first residents of Jewish descent were brothers Asa and Henry Leopold and newlyweds Bernard and Nettie Silberstein. The Silbersteins were immigrants from Hungary who arrived in the United States in the 1860s, married in Detroit, and came to Duluth in 1870. Bernard set up a dry goods store. The Leopold brothers opened the first mercantile store in Duluth in 1869. Together with other western European Jews, the Silbersteins and Leopolds founded Duluth’s first synagogue, Temple Emanuel, in 1891. There was no building and services were performed by “pious local elders” and occasionally a visiting rabbi. Most of Duluth’s Jewish population was Russian or Eastern European. 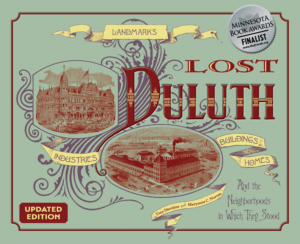 They began arriving in Duluth in the 1880s. By 1900 Duluth had four synagogues — Tifereth Israel, Temple Emanuel, Adas Israel, and B’nai Israel — serving about 1,500 members. At one point six separate synagogues served Duluth, but the Zenith City’s Jewish population would grow no higher than its peak of 4,000 in the 1930s. Russian Jewish immigrants organized the Orthodox Kofereth Israel Congregation in 1893, later changing the name to Tifereth Israel. They purchased a small house at Third Avenue East and Fifth Street and converted it into a synagogue. With no formal rabbi, the congregants conducted services themselves. Cantors served at the High Holidays, and from time to time the rabbi from another Duluth synagogue, Adas Israel, helped out as well. In 1922 the congregation spent $50,000 to build a two-story brick synagogue on the southeast corner of Third Avenue East and Fourth Street, with a round Star of David window centered in the front gable. The synagogue remained Orthodox until 1945 when its members voted to become Conservative. Tifereth Israel was often referred to as the Fourth Street Synagogue. In November 1969, after Duluth’s Jewish population dropped below 1,200, Conservative congregation, Tifereth Israel, joined with Reform congregation, Temple Emanuel, to form a new congregation, Temple Israel. The Tifereth Israel congregation left their synagogue to attend services at the Temple Emanuel building at 1902 East Fourth Street. That building was later purchased by the Glad Tidings Assembly of God Church; Glad Tidings has since changed its name to The River Church. Temple Israel is now housed at 1602 East Second Street, the former Jewish Educational Center. Messiah Lutheran Church purchased the Tifereth Israel building and held services there until 1994. The building was demolished in about 1995; a parking ramp for St. Mary’s Medical Center now occupies the lot. Duluth’s only other remaining synagogue is Orthodox Adas Israel Congregation at 302 East Third Street, also known as the Third Street Synagogue. The congregation, originally Lithuanian Orthodox Jews, was organized in the 1880s in today’s Canal Park Business District south of Buchanan Street. In 1930, the West End’s B’nai Israel Synagogue disbanded, as many of its members had moved to the Central Hillside. Adas Israel, Tifereth Israel, Shaara Tzedak, and Talmud Torah Congregation absorbed its members.